The GOES-17 satellite, which blasted off March 1, covers the western U.S. where forecasters were hampered by a lack of high-quality data. This is important because many weather systems are born in the Pacific Ocean where, before now, forecasters have been hampered by a lack of high-quality data. In the next two weeks the GOES-S (to be renamed GOES-17) will be orbiting 22,300 miles above earth and ready for testing. It blasted off from Cape Canaveral March 1. The National Oceanic and Atmospheric Administration (NOAA) says its satellite will collect three times more data at four times better resolution and scan the earth five times faster than previous satellites. GOES-16 is already in place in the Eastern U.S.
Help forecasters better predict and prepare for extreme weather. Provide reliable storm data when radar cannot, like in the case of Hurricane Maria. Monitor lightening from cloud to cloud and cloud to ground. Locate wildfire hotspots more quickly with red-green-blue thermal infrared imagery. The data is fed into computer models used by forecasters at the National Weather Service. NOAA says the GOES series is the first leap in weather satellite capability in more than 20 years. "When you think about, now, the availability of information from satellites, from ground, from airplanes, from the whole Internet of Things is going to allow a certain integration of information in a way that we can understand the earth as a system much more holistically than ever before," according to NOAA's Acting Secretary for Environmental Observation and Prediction Stephen Voltz. This also helps your smartphone weather app to be more accurate and timely. Weather Service Radar Is Down, So Who's Looking Up? 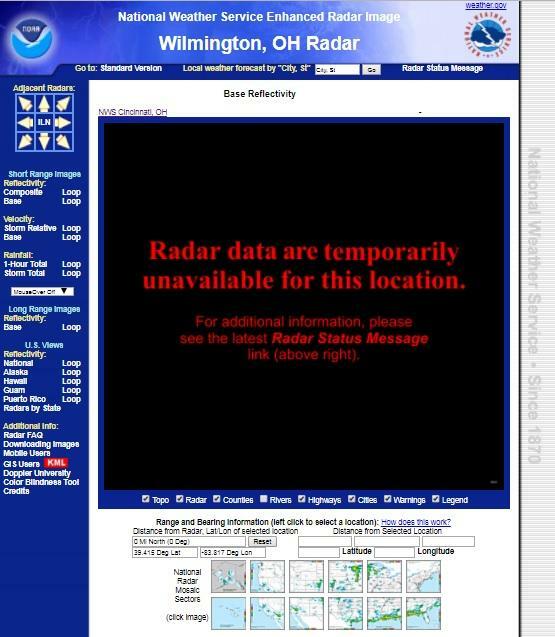 The National Weather Service's Wilmington radar is off-line, and will be for much of the month. Meteorologist Kristen Cassady says it was shut down Monday for a scheduled software upgrade. That's when it was discovered that hardware was wearing out.